SEE WHALES AND PARTY TOO! 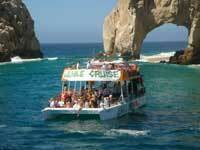 Have a wild and crazy time aboard the wildest boat in Cabo San Lucas and see whales too! During whale season (December 15 through March 31), you'll have an opportunity to see gray whales as they migrate through the Baja area of Mexico, where they come every year to calve. Aside from seeing whales, you'll also dance, party, and of course DRINK your way to Land's End, including close up views of the iconic Arch, Sea Lion Colony and Pelican Rock, then enjoy dancing on board as you party your way back to the marina. Twice Daily at 9:30 AM and 1:30 PM, From December 15 through March 31 only. The rest of the year, check out the same cruise without the whales - Jungle Cruise Snorkeling. Your ship doesn't sell this tour - but you can book it here! LIMITED AVAILABILITY FOR MARCH. TO MAKE A RESERVATION CONTACT US. ALL OTHER DATES ARE AVAILABLE WITHOUT CALLING. This is a fun tour to take for spring break and young people, or those young at heart. There is dancing, party music, mambo lessons, and of course audience participation contests. If you want to see whales and party too, this might be a good option for you.